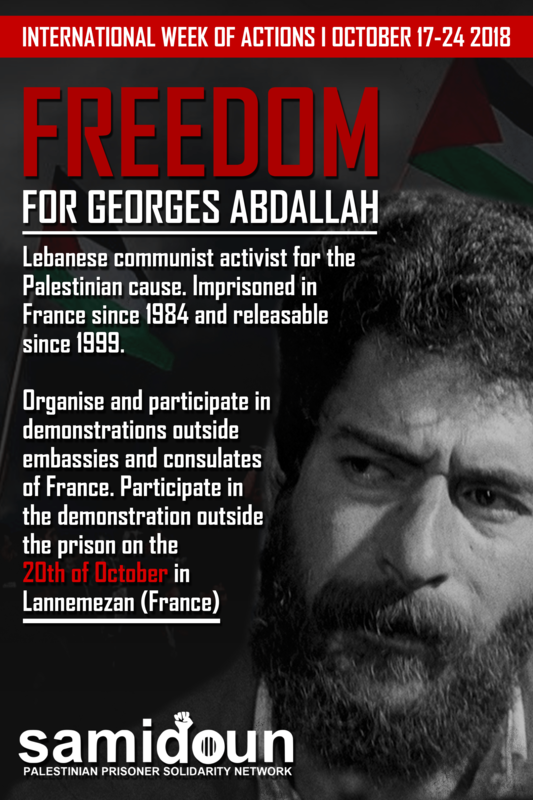 On 24 October 2018, we will mark the 34th anniversary of the arrest of Georges Ibrahim Abdallah, revolutionary Lebanese Arab Communist struggler for Palestine, by French police. Since 1984, he has remained behind bars, one of the longest-held political prisoners in the world. From 17-24 October 2018, join Samidoun Palestinian Prisoner Solidarity Network, the campaign to Free Georges Abdallah and organizations in France and around the world. Organize protests, campaign on social media and distribute information this week in your community to demand freedom for Georges Ibrahim Abdallah and all Palestinian prisoners! Georges Abdallah has been committed throughout his life to the revolutionary struggle in Lebanon and the liberation of Palestine – and to a revolutionary vision of human liberation. He worked with the Palestinian leftist organization, the Popular Front for the Liberation of Palestine, resisting Israeli attacks on Lebanon. Later, he joined other Lebanese revolutionary leftists in the Lebanese Armed Revolutionary Factions, pointing to a non-sectarian, socialist and revolutionary path to liberation for the people of Lebanon, faced with civil war militias and Israeli invasion and occupation. Today, Georges Abdallah remains behind bars. Despite being eligible for release since 1999, his parole applications have been denied repeatedly. Even when he has achieved a victory in court, French officials like former Prime Minister Manuel Valls have intervened at the highest levels to block his release. U.S. officials like former Secretary of State Hillary Clinton have also intervened in an attempt to keep Georges Abdallah in prison. In essence, Georges Abdallah is a prisoner not only of the French colonial state but also of U.S. imperialism and the Israeli occupation. Meanwhile, the Lebanese government has failed to live up to its responsibility in seeking the freedom of its imprisoned countryman. Despite being held in Lannemezan prison for 34 years of his life, Georges Abdallah is an active participant in struggle. He has written letters and issued statements in response to revolutionary struggles around the world and always maintains a special eye toward the Palestinian prisoners, who have declared him one of their own. 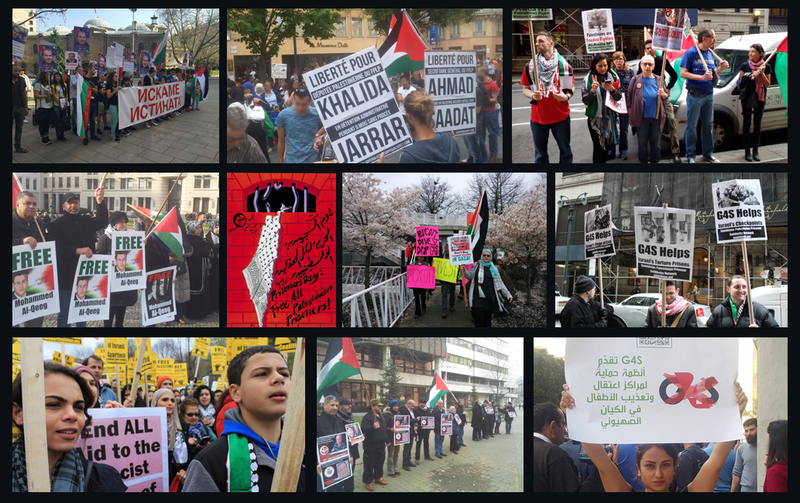 Georges Abdallah is not alone; his imprisonment is part and parcel of that of nearly 6,000 Palestinian political prisoners in Israeli jails and the prisoners of Palestine in U.S. and other international jails – as well as the prisoners of struggles against capitalism, racism and imperialism around the world. Georges Abdallah and his fellow prisoners are imprisoned in an attempt to silence and suppress the anti-colonial struggle of the Palestinian people for justice, liberation and return. However, despite all repression, their leadership remains a symbol of hope and inspiration to all those who struggle for freedom. Join the movement to free Georges Abdallah, free Palestinian political prisoners and free Palestine, from the river to the sea!